In his address to the House, the Youth Prime Minister said that he accepted the responsibility just to be able to fill a vacuum procedurally even though the vacuum left by the sad departure of the Youth Prime Minister Mr. Hassan Javed Khan and his cabinet members martyred on July 28 cannot be filled in the minds and hearts of the Youth Parliament. “We vow to carry the mission of our fallen Youth leaders forward and we owe it to Pakistan to step forward and shoulder our responsibilities,” he said. The Youth Prime Minister also filled the vacant cabinet posts after the tragic demise of Youth cabinet members including Ms. Fatima Salim Khwaja (YP33-PUNJAB15) as the Youth Minister for Information; Mr. Muhammad Adil (YP37-PUNJAB19) as the Youth Minister for Culture, Sports and Youth affairs. 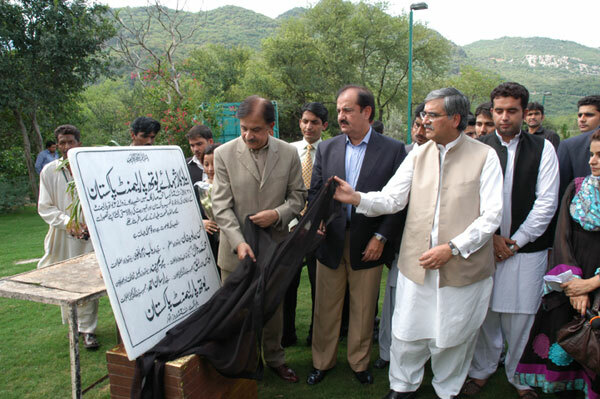 The Youth Parliament members also organised a commemoration ceremony at the Margalla Hills, together with the CDA Chairman Mr. Imtiaz Inayat Elahi and the Chief Commissioner Islamabad, Mr. Tariq Pervaiz to erect a monument for the Youth Parliament martyrs. The Youth Parliament members, who thanked the CDA Chairman and the staff of CDA for their swift and active facilitation for organising the ceremony, said that they wished to leave behind a monument befitting the martyrs of democracy. “We plan to build a monument wall near the site of the accident soon to pay our respects to those who lost their lives,” said the CDA Chairman Mr. Imtiaz Inayat Elahi. Offering his condolences to the Youth Parliament members at their loss he said that it is the loss of 6 trained future leaders for Pakistan. 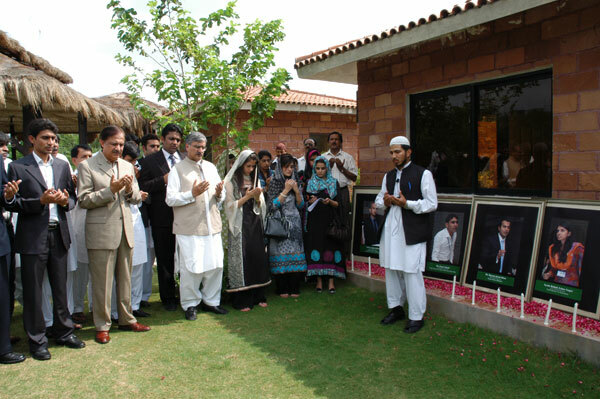 “One cannot distinguish between the flowers and the faces of the Youth Parliament’s martyred members,” said the Chief Commissioner Islamabad, Mr. Tariq Pervaiz commenting on the floral wreathed photographs of the 6 deceased members of the Youth Parliament at the commemorative ceremony while expressing his grief and sorrow at the loss that is both of the nation and of the Youth Parliament and the families of the 6 deceased members. “We are proud that our youth is conscious, aware and getting trained for its responsibilities towards a democratic Pakistan through the Youth Parliament platform,” they said. Mr. Ahmed Bilal Mehboob, PILDAT Executive Director and Secretary Youth Parliament Secretariat said that we are both sad and proud today; sad at our huge and irreparable loss of these young leaders and proud that the Youth Parliament, despite such a catastrophe and deep sorrow, displayed maturity worthy as future leaders of Pakistan, in continuing the fifth and final session. “The Youth Parliament decided that the best way to honour their lost members is to discuss the very policies, agendas, bills and issues that their lost members were travelling to present and discuss in the Youth Parliament,” he said. The Steering Committee of the Youth Parliament personally represented by Senator S. M. Zafar, Mr. Wazir Jogezai and Mr. Khurram Dastgir Khan, MNA, and in thoughts, prayers and support by other members including Mr. Faisal Karim Kundi, MNA & Patron Youth Parliament, Dr. Donya Aziz, MNA and Ms. Anusha Rahman Khan, MNA, guided the Youth Parliament in this time of grief and is immensely proud of the way the Youth Parliament members steered the final session while welcoming amongst them, and engaging on national issues such as the State of Education and Foreign Policy of Pakistan with, guest speakers such as Mr. Ahsan Iqbal, MNA, former Education Minister of Pakistan; Mr. Khurshid Mahmud Kasuri, former Foreign Minister of Pakistan and Mr. Adam Thomson, British High Commissioner to Pakistan, acknowledged Mr. Mehboob. Earlier in the last day of the final session, the Youth Minister for Education, Health and Environment Ms. Maria Fayyaz (YP32-PUNJAB14) tabled the Youth Education Policy 2010. The Youth Education Policy, developed under the leadership and guidance by the deceased Youth Prime Minister Mr. Hassan Javed Khan, was dedicated to his memory and unanimously accepted. Te policy, developed on the National Education Policy 2009 of the Government of Pakistan, seeks to enhance budgetary allocation of 7% of the budget for education to up to 15% of the budget in 2015. The Youth Education Policy 2010 highlights reforms of the education system, establishment of schools for the special children, reforming the Madrassa System and the need to finish the apartheid in the system of education across Pakistan. Development of district education boards; revision of pay scales and incentives for qualified teachers for their retention; elimination of quota system in districts with focus on merit-based tests; development of registered School management committees to increase the parent-teacher interaction; emphasis on the positive role of civil society in making donation banks for books; preparation of annual reports for constant monitoring and evaluation; nationalization of educational curriculum as opposed to the recent move of curriculum as a provincial subject under the 18th Constitutional amendment, etc. are some of the key features of the policy. Discussing the policy, Mr. Muhammad Aatif (YP01-AJK01) drew the attention of the House towards the deplorable conditions of Schools for Special Children. He said that these must be provided with well-qualified teachers along with all the necessary facilities like brail books, software facilities, etc. These schools must also be equipped with facilities for extracurricular activities for special children, he said. Mr. Lehrasip Hayat (YP23-PUNJAB05), Youth Leader of the Opposition, added to this policy underscoring the need for proper funding system for Madrassa Education. Ms. Noor Bakht Ghumman (YP28-PUNJAB10) and Ms. Anam Javed Cheema (YP29-PUNJAB11) presented a resolution that the Ministry of Education should take immediate measures to train the teachers to abolish the system and methods of cramming for the students and instead focus on critical learning capacities in students and training for teachers. The resolution was unanimously adopted by the House. The House unanimously adopted another resolution put forward by Mr. Ehsan Naveed Irfan (YP13-KP02) that the Government should take immediate steps to rebuild the institutions, hospitals and properties affected by the 2005 Earthquake and it must also fulfil the promises made in this regard. Mr. Aurangzeb Khan Zalmay (YP16-KP05) invited the attention of the Honourable Speaker that the awarding of extension to the Army Chief Gen. Ashfaq Pervez Kayani by the Government is negation of the spirit of meritocracy in the country. The House was of the opinion that merit must be promoted in order to keep the true spirit of justice in the country. Through another Calling Attention Notice presented by Mr. Aurangzeb Khan Zalmay (YP16-KP05), the House demanded the immediate restoration of telecommunication and mobile services in D.I Khan and Bannu and to offer immediate relief to the victims of floods in these areas. 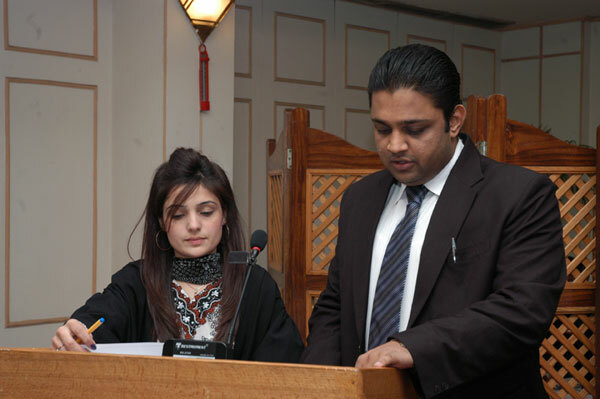 The last and final sitting of the 2009-2010 batch of Youth Parliament was followed by elections to the Youth Parliament Pakistan Alumni Association 2009-2010. 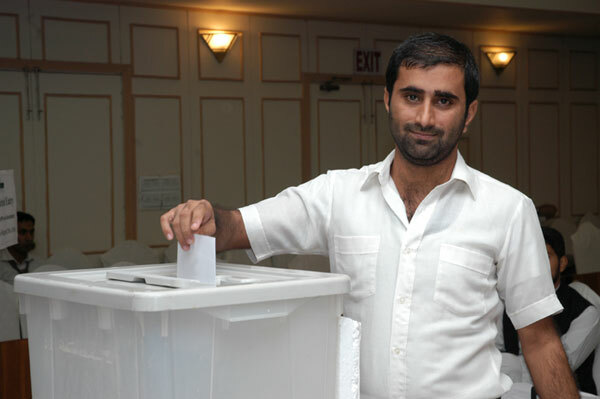 Ms. Anam Javed Cheema (YP29-PUNJAB11) has been elected as the President of the YPP Alumni Association 2009-2010, while Syed Manzoor Shah (YP04-BALOCHISTAN03) has been elected as the Vice President Balochistan and Gilgit-Baltistan; Mr. Ehsan Naveed Irfan (YP13-KP02) elected as the Vice President FATA and Khyber Pakhtunkhwa; Mr. Imtiaz Ali Khuro (YP46-SINDH09) Vice President AJK and Sindh; and Ms. Asbah Rehman (YP30-PUNJAB12) has been elected as the Vice President Punjab & ICT. The office of the General Secretary YPPAA 2009-2010 has been filled by Mr. Kamil Qudus (YP22-PUNJAB04) while Mr. Muneeb Afzal (YP09-ICT02) has been elected as the Finance Secretary. Today marked the completion of the final session of the third batch of Youth Parliament Pakistan, a project conceived, planned and implemented by PILDAT since 2007. The first-ever batch of Youth Parliament Pakistan completed its first term successfully in 2007-2008 while the second batch completed its term in 2008-2009. The third batch of Youth Parliament Pakistan, 2009-2010, despite suffering a huge tragedy in the shape of death of its 6 members on-board Airblue flight on July 28, 2010, completed its 1 year term today.